Nicologic | Exercise your brain ! Learn how to calculate the weekday of any date in your head ! This test contains 10 questions to assess your spatial aptitude. You will be shown 5 pictures rotating. Your task is to find the odd-one-out. There are 4 similar pictures and 1 distinct that does not respect the logic. This test evaluates an IQ up to 145. This test measures the quality of your attention. You will be shown a sequence. Click on the square where the value has changed ! This test contains 10 questions to assess your visual working memory. You will be shown one picture during one second. Your task is to find the two pictures which form the first one. D is the correct answer. This test measures your visual short-term memory and contains 10 questions. 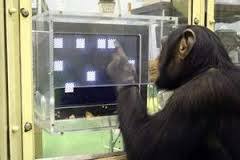 Chimps have been shown to outperform humans in this task! This test is difficult. Score >= 7 is excellent. 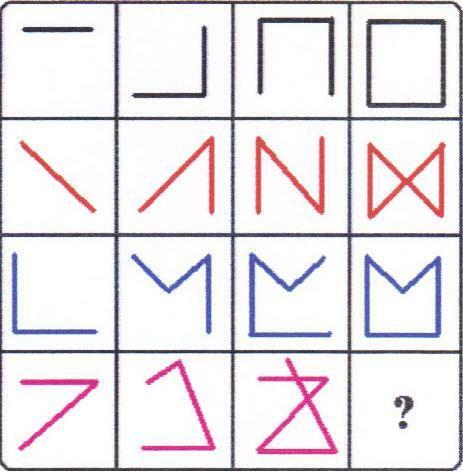 This test measures your visual-spatial abilities and contains 10 questions. Here is a sample : which figure is not like the others ? 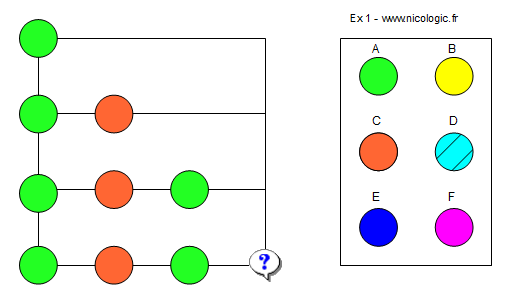 The correct answer is C (logical sequence : green, orange, green, orange). 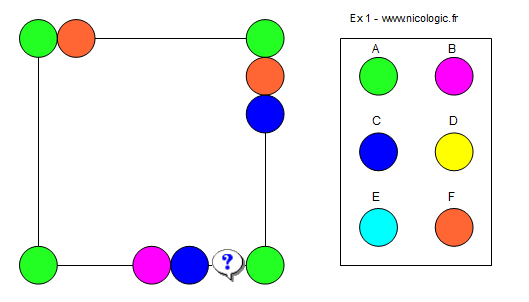 The correct answer is F (logical sequence : green, orange, blue, purple). D is the good answer to respect the symmetry of the pictures. This test contains 10 questions. Your task is to fill a grid with the correct items. The example shows items (imagine a house) which are visible from a certain face (imagine a street). Your task is to identify a ball named X. In each row, I give you indications about X. After observing the indications, you will logically identify X. Your task is to identify a square named X. C is the good answer. Four little quizzes about science history, physics, medicine, biology, astronomy, mathematics, etc. 20 questions. No time limit. You will be shown two images. Your task is to determine whether the first image contains EXACTLY all the elements to create the second image. This test contains 20 questions in order to assess your cognitive skills. This B version is harder than version A. Answer : « B R » because we can infer that B represents the blue and R the red. This test contains 10 questions in order to assess your spatial aptitude. This test measures your logical reasoning skills and contains 20 questions. Answer: « B R » is the correct answer because we can infer that the letter B is represented by the blue circle whilst the letter R is represented by the red circle. This test measures spatial awareness and contains 10 questions. Answer: C is different from the others. 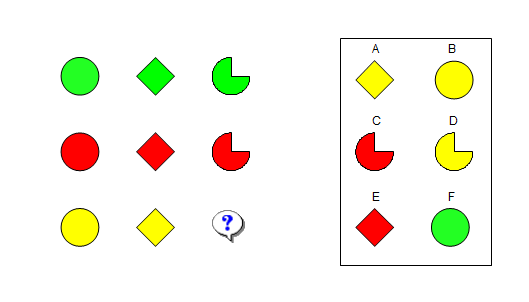 This test measures perception and visual discrimination abilities and contains 10 questions. Answer: D is different from the others. This test contains 20 questions and measures an IQ up to 145 in 8 minutes. This funny combinatorial aptitude test contains 20 questions and measures in order to assess your computation ability and your short term memory. This practice question will help you understand the logical principles underpinning the test before proceeding to the next step. The correct answer is F.
This IQ test contains 15 questions and estimates IQs falling within the range of 80 and 135. Your task is to identify the TWO images that are distinct from the others. This test measures an IQ up to 140. This IQ test contains 30 questions and gives a score between 75 and 170. This IQ test contains 18 questions and gives a score up to 145. This test aims to provide more precise estimates of IQs in the very high range (from 130 up to 180)! This test aims to measure high IQs in the range up to 155 ! 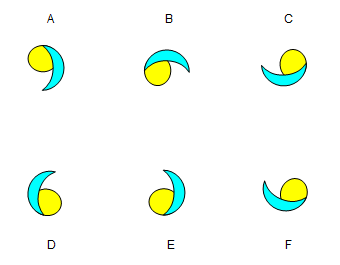 Answer : in the third image, the arrow does not show the same pattern. This test aims to provide a precise estimate of your IQ (measurement up to 180). This is a timed test with a 25 minute limit. 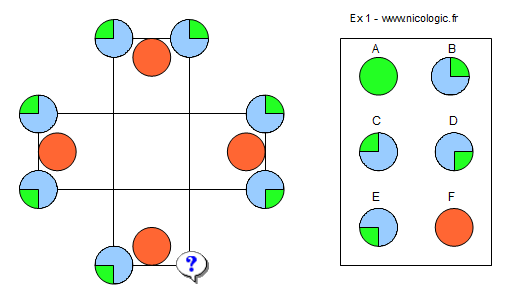 Which two figures have to be exchanged to get two logical matrices? This test measures IQ up to 170. Here is a sample : Your task is to identify the two images that logically complete the sequence on the first row. This test measures pattern recognition skills. Time limit is 30 minutes. Partial IQ measurement up to 170. This aptitude test contains 27 questions on numbers and arithmetic logical sequences. The score obtained on this test does not correspond to an IQ level but rather provides you with an assessment of your numerical intelligence. Here is a sample: Find the missing number that follows logically in this sequence. Answer: the correct answer is 2 as the right hand side of each images is the sum of the number of the left hand side of the image (i.e. 6 = X + 4, so X = 2). This test measures your abstraction and categorization abilities and contains 25 questions. The first row contains « good » images. The second row contains « bad » images. You must find the two missing « good » images in the third line. Find the images which are categorized as “good”. This combinatorial aptitude test contains 20 questions in order to assess your computation ability and short term memory.